An easement is an interest in real estate that gives one person the right to use someone else's land for a specific purpose. The focus of an easement is on usage, not on ownership. There are two types of easements: an easement appurtenant and an easement in gross. Further, easements can be affirmative or negative. An appurtenant easement benefits the dominant estate and runs with the land when the property is transferred. An easement in gross benefits an individual or a legal entity. 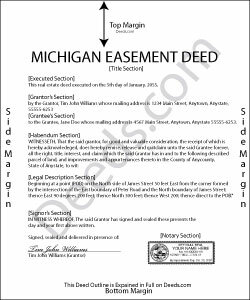 An easement in Michigan is generally created by a deed in writing or by operation of law. The easement deed should specify the terms and conditions of the easement itself. As an interest in real property, an easement deed in Michigan must be signed, dated, and acknowledged by the grantor. If an easement deed is executed in Michigan, it can be acknowledged before a judge, clerk of a court of record, or notary public within the state and should be endorsed with a certificate of acknowledgment by the officer taking acknowledgments (565.8). Michigan adheres to the uniform recognition of acknowledgments act, which means that an instrument acknowledged out of state can be recorded in Michigan if the instrument complies with that state's laws (565.9). Recording can be a crucial step in protecting easement rights. An unrecorded easement deed is void as against any subsequent purchaser in good faith and for a valuable consideration, of the same real estate or portion thereof, whose conveyance is first duly recorded (565.29). Sheryl B. said: Great forms. Just what I needed.